J’baro a member of the Jabari clan in wakanda (the worship the white gorilla and serve under the now deceased M’baku-the man ape who died in Black Panther vol.4 #4) is picked up at the airport by Black Panther in disguise. He’s realized that this man has made calls numerous times from inside shadowland where Kingpin is in power. After a car ride in which he chides the royal family of wakanda T’challa crashes the car and has J’baro sign over all his power as a member of the wakandan bank to anyone he chooses. 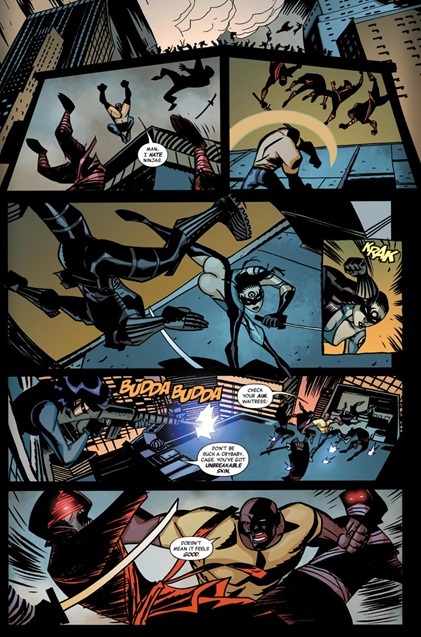 Inside Shadowland Miyu gets a special mission from Kingpin Lady Bullseye and Typhoid Mary warn her to not distract there master from his mission before kingpin send them to track down the doctor who escaped a few issues back. They find the location but the doctor has already been moved and T’challa takes the fight directly to them. They think they have lead him into a trap as hand ninja attack but he calls in Luke Cage and Falcon as backup. 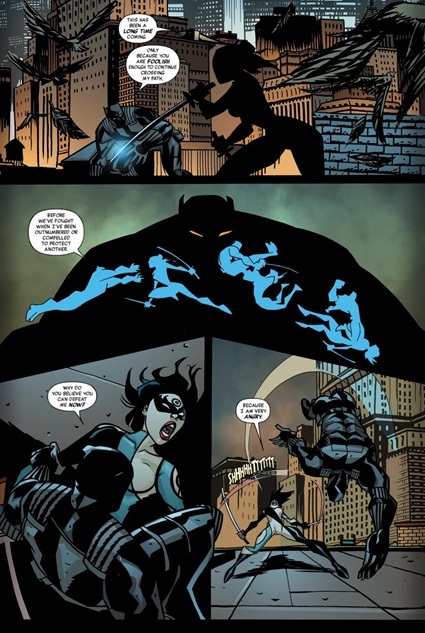 The hand retreats and Miyu reports what’s happened to Kingpin who gives orders to attack wakanda directly. Cover- Perhaps is nostalgia already knowing that this book is coming to a close but I liked the Francavilla drawn cover despite it’s old newspaper quality. Art- Michal Avon Ceming won’t win any awards for detail but he has a feel of the action that surpasses every other artist on this book to date. Characterization- It’s awesome to see T’challa portrayed as not just a super smart strategist but world class fighter to boot, facing lady bull’s-eye and Typhoid Mary while engaging in a battle of wits with Kingpin. 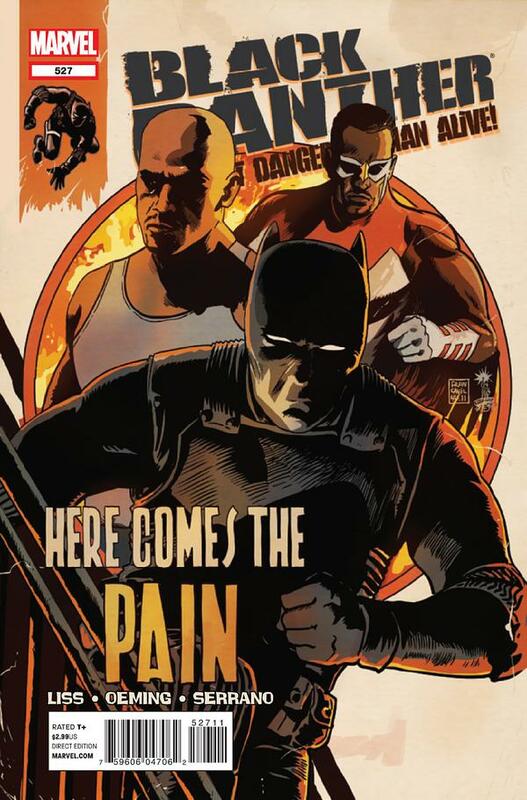 Action- Sweet glorious action guys, Ninjas gets pounded every which way from Sunday as T’challa, Falcon and Luke Cage cut a swath through Kingpins forces. Wakanda– Kingpin will now attempt to attack wakanda directly since T’challa has him at a disadvantage in America. Poor Kingpin he has overplayed his hand Wakandans are badass! I expect Shuri and the Dora Milaje will make short work of the hand who can’t even take on the most basic of American heroes. Art- The minimalist approach may not be suited for everyone. Cancellation- On one hand I want the book to end since I hated about ½ of this run but this last storyline much like the first set of issues shows that David Liss could write an engaging and exciting Black Panther run, he got a handle on T’challa’s personality but for some reason the stories were hit and miss. It’s sad to see a series end when the stories are just picking up pace again.